As promised, here are the notes on Ajna (brow or 3rd eye) chakra which we focused on this morning. Did anyone else notice how resonant and calm the integrated “AUM” sounds were at the end of the class? Or how steady your standing balances were? Beautiful. Thank you. Next post: more about Sahasrara (crown) chakra which we started working with this morning. Next week we pull everything together in the closing chakra integration class. The sixth chakra is located between the eyebrows – the so-called 3rd eye. It governs our thoughts, honesty, inner and outer sight, our visions and our dreams, intuition and awareness. 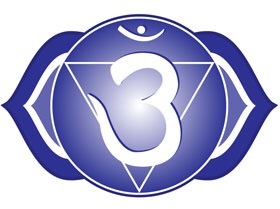 This chakra is associated with light and the colour indigo and as you work with it, it can be helpful to see the third eye as access to a cosmic vision, illuminating everything as it is without the filter of your past, your expectations or your judgment and allowing you to start seeing things as they really are, without the colour and projection of the ego. 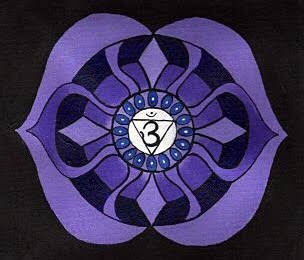 The development of this chakra is vital for personal and spiritual growth because it helps us awaken from the illusions in life that we unconsciously accept as real … until our third eye opens, and we start looking beyond dualism. Most people are content to accept the commonly-held views of reality as presented and reinforced by popular media (TV news programs, movies, social media and books). Our early schooling teaches a simple or childlike view of the world that often extends, unexamined, into adulthood. It will take third eye chakra development in order to see past what we are told is true, and to make our own evaluation. The sixth chakra is holistic in nature so when fully activated, both hemispheres of the brain function in synchronicity. The right hemisphere’s creativity and synthetic thinking is integrated and balanced with left hemisphere’s logical and analytical thinking. Nadi Sodona using Nasgra mudra is a wonderful breathing exercise for Ajna for this reason, but we simply didn’t have time for it in this morning’s practice. The third eye is not only the seat of wisdom, but also a seat of conscience. This is where you not only see what is going on, but you also know what it means. When your third eye is open, you not only see but you also understand. Any posture that you feel most able to connect with your inner self is a good place to start, including Child’s pose with the brow resting gently on the mat. Eye cupping or eye exercises are a wonderful way of focusing on the gaze and sight, and any postures that see you crossing the midline of the body are powerful for integration of left and right sides of the brain (Garudasana – Eagle pose – is one of these). In addition, any postures that bring focus to the brow serve to harmonise the consciousness by balancing the lunar and solar energies within ajna chakra, increasing alertness and intelligence, and making the spirit feel aroused, enterprising and vivid. Nasgra mudra is a hand position one which gentle but firm pressure is applied to the brow chakra, and can be used with any asana for the purposes of stimulating the third eye. Click here for a beautiful guided meditation for Ajna chakra. What behavior and thought patterns can I identify in my life? What beliefs do I have that cause me to judge another person negatively? What would I like to know more about? If you had one question to ask a psychic, what would you ask? Name a time when you listened to your intuition and it worked, and name a time you didn’t follow your intuition and the results were unfavorable. To tune into your sixth chakra: Take a break from watching the news and perusing your friends’ newsfeeds. Take ownership over what you consume; what you read and watch. Bust out the old magazines, and make a vision board. Write your vision down, and hang it somewhere you look every day. Read a book. Look at the sea. See the beauty everywhere, even when it’s the hardest thing to do.